Homegrown tomatoes are the stuff happy summer memories are made of. The flavor of store-bought tomatoes usually pales in comparison, but growing a tasty tomato takes much more than luck. Tomatoes need at least eight hours of sun and one to two cubic feet of loose, rich soil to accommodate the roots of each plant. They can be grown in large containers or in the ground. If you're growing tomatoes in the ground, it's best if the planting area is raised at least six inches above the surrounding grade to ensure good drainage. Tomatoes are also dependent on warm weather to grow and produce fruit, consequently, tomatoes should not be planted until nighttime temperatures are consistently above 50 degrees. 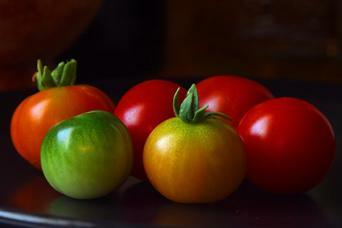 Besides the size, flavor and color of their edible fruits, tomato plants vary in height. Look carefully on the seed package or seedling label for the words 'determinate' or 'indeterminate'. Indeterminate indicates plants that will keep growing as long as the weather stays above freezing. Commercial growers sometimes train these varieties up to 10 feet tall in greenhouses! Indeterminate types will need major staking to support the vines, but there are many dwarf varieties that can be grown with a small tomato cage inserted into a five gallon pot and placed on a sunny deck or balcony. To raise healthy plants and delicious tomatoes, there are several important steps to follow along the way from seed to harvest. 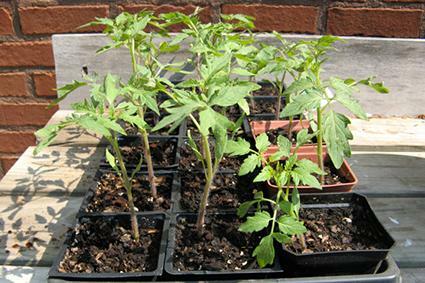 Tomato seed is easy to germinate using a standard potting soil and plastic 'cell packs.' The seed should be planted six to eight weeks before the average last day of frost in your area. Plant the seed about one-fourth-inch deep in the cells and place in a sunny window. Keep the soil evenly moist until the plants sprout. The seeds should begin to germinate in about a week and several weeks later will be big enough to transplant to four-inch pots. Continue growing these indoors until nighttime temperatures are consistently above 50 degrees. Once the weather has warmed, begin the process of acclimating the seedlings to outdoor conditions. Move them outside in a sunny position for a few more hours each day over the course of a week. This step helps tremendously in reducing transplant shock. Beds in the ground should be tilled to a depth of six or eight inches, incorporating a two-inch layer of composted manure or other form of soil amendment. Remove each seedling from its pot and gently loosen the roots before planting it. It's best to bury one-third to one-half of the stem at planting time. This will develop a stronger root system that is more capable of supporting the tremendous top growth that is to come. Suggested spacing for tomatoes plants is normally 24 inches apart set in rows that are 30-36 inches apart. The seedlings seem so small at first, but as they mature they will need this much room. If they are crowded and don't get the air circulation they need, disease is more likely to proliferate. Cylindrical tomato cages are a great way to support the tomato plants as they grow. Make sure to use cages that are big enough to support the varieties that you have planted. Simply train the long flexible stems through the holes in the cages as they grow. Tomato seedlings need regular moisture, but as the fruit begins to ripen it's best to back off on the amount of moisture they receive. This is one of the secrets to growing tomatoes with rich flavor - excessive irrigation equals watered-down taste. It's hard to believe, but the best tomatoes come from plants that are watered just enough to keep the foliage from wilting. Most people are unaware that pruning plays a part in growing healthy tomatoes. Tomato plants often produce an excess of vegetative growth that dilutes the energy the plant puts toward ripening individual fruits to perfection. 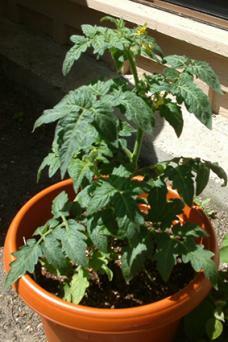 In addition, a dense, bushy tomato plant is much more likely to become diseased. Once flower clusters have formed in six or eight places, prune off any new shoots that emerge from near the center of the plant to prevent more fruit from forming. If the growing season is long enough, and the plants stay healthy, you can allow some new sets of fruit to develop for a second harvest later in the growing season. It's actually a good idea to pick tomatoes just before the peak of ripeness and bring them indoors to complete the ripening process. If left on the vine, they are prone to cracking open and rotting prematurely. Early varieties are suited for northern areas, have more compact plant growth and work well for short growing seasons. However, one disadvantage is that the fruit can sunburn in hot weather, so if your summers are hot it is better to choose from the main crop varieties for a summer-long harvest. These varieties will bear medium-sized to large fruit and are relatively free from cracking and other deformities. They are considered "main-crop" varieties because they make up the bulk of tomato harvest. They are best grown in sturdy wire cages benefit from pruning. 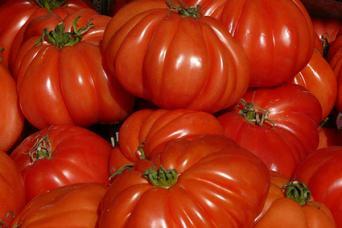 Extra-large tomatoes are usually late-maturing. While the fruits may be really big, they are not always perfect. In fact, they are often misshapen, lacking the visual perfection we expect in the grocery store, but packing plenty of the character that homegrown tomatoes are known for. Get your plants off to good start with a dilute solution of water and liquid fertilizer on a weekly basis. Early fertilizer applications should be high in nitrogen. When blossoming occurs, switch to fertilizers higher in phosphorus and potassium. Deep, infrequent waterings are better than shallow, more frequent waterings. Avoid getting the leaves wet by watering at the ground level only. Tomatoes are much more susceptible to disease in wet, humid conditions. Using a plastic mulch will warm the soil, cut down on weeding and help retain moisture. 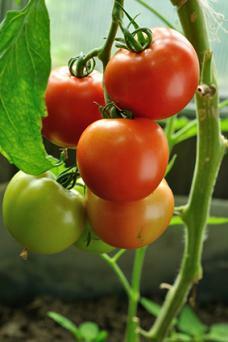 Tomatoes are at the top of the list of summer vegetables to grow for most gardeners. Taking a few extra steps to care for your plants will help ensure that your efforts are rewarded with a delicious harvest.